Get dialed in. 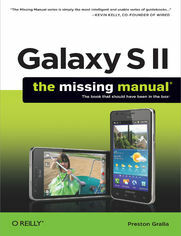 Learn your way around the Galaxy S II&#8217;s calling and texting features. Go online. Browse the Web, manage email, and download apps with Galaxy S II&#8217;s 3G/4G network (or create your own hotspot). Master your media. Shoot and share pictures and video, organize and play your music library&#8212;and send it wirelessly to your TV or stereo. Be entertained now. Start watching movies and TV shows while they&#8217;re still loading. Preston Gralla is the author of more than 40 books, including Missing Manuals on Droid X2, Xoom, and Galaxy Tab. He&#8217;s the editor of WindowsDevCenter.com and OnDotNet, and a contributing editor to Computerworld. What Happened to Google Tasks? What Can You Control with Your Voice?